What are GABA Receptors and Why are they Important? The GABA receptors are a group of receptors that recognises the amino acid GABA. The amino acid GABA is an important neurotransmitter in mammals and other animals. GABA receptors are located throughout the body, including in the brain and central nervous system. GABA receptors can be categorised into the GABAA and GABAB receptor subtypes. GABAA receptors are a type of receptor that forms an ion channel. 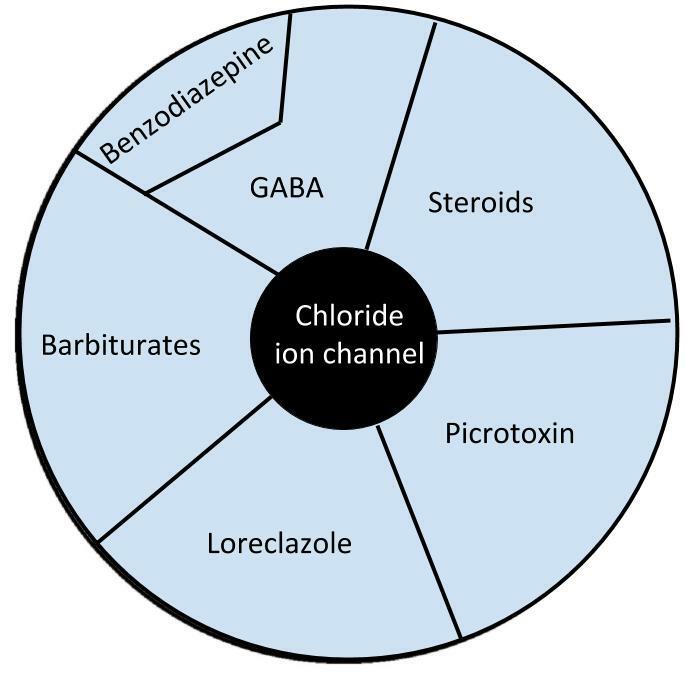 When GABA binds to the GABAA receptor the ion channel opens and this allows chloride to enter the neurone. The chloride carries with it a negative charge, and this decreases the membrane potential of the neurone, reducing the ability of the neurone to transmit a signal. The overall effect of this activity is a reduction is the electrical excitability of the neurone and if multiple neurones are affected, a reduction in the electrical excitability of the brain as a whole. The response of the GABAA receptors to GABA is rapid and the overall effect is calming and relaxing. GABAB receptors have a similar effect to GABAA receptors but work in a different way. GABAB receptors are not ion channels, but are linked to second messenger systems in the cell (G proteins associated with adenylate cyclase). These receptors are called metabotropic receptors and when activated by GABA they initiate cellular changes including the release of calcium ions, and these calcium ions cause the opening of potassium channels. This causes potassium ions to leave the neurone carrying with it a positive charge. This reduces the membrane potential of neurones and decreases the electrical excitability of the cell by reducing the chance that the neurone transmit a signal. The GABAB receptor therefore has the same overall effect as the GABAA receptor in that they both reduce the electrical excitability of the brain, however while the GABAA receptor does this in a fast way, the GABAB receptor produces a slower and more sustained response. Overall, activation of both GABA receptors induces a calming and relaxing effect. A number of substances other than GABA can also bind to the GABA receptors and these include benzodiazepines, steroids, picrotoxin, loreclazole and barbiturates. These substances tend to bind to GABA receptors in locations separate to GABA itself. Some of these substances are able to activate the GABA receptor and cause calmness and relaxation, whereas some can block its activity and produce excitability. Both benzodiazepines and barbiturates are used in the treatment of anxiety, and both drug types are thought to bind to and activate the GABA receptors in a similar way to GABA. This explains their therapeutic use as treatments for anxiety, as both are able to induce a calmness and relaxing effect, albeit with a certain degree of sedation. Certain polyphenols may also bind to the GABA receptor in the same location as benzodiazepines. The flavones apigenin and chrysin and the flavonols quercetin and kaempferol may for example exert their anti-anxiety effects through activation of the benzodiazepine part of the GABA receptor. A diagrammatic representation of the GABAA receptor. The diagram shows the compounds that can bind to the receptor. Barbiturates, benzodiazepine, steroids (including cortisol), GABA and loreclazole can activate the receptor, whereas picrotoxin can block the receptor. The central channel is a chloride channel that opens when the receptor is activated. This allows chloride ions to pass into the neurones, reducing the membrane potential and decreasing the electrical excitability of the cell. The part of the GABA receptor that bind loreclazole has also been shown to bind with valerenic acid, a component of valerian. This may explain the sedative and anti-anxiety effects of extracts of valerian that contain valerenic acid. Picrotoxin is a phytochemical poison that has been shown to bind the GABA receptor and to block its activity. By blocking the GABA receptor picrotoxin is able to increase the electrical excitability of the brain and picrotoxin is therefore considered a stimulant and convulsant. A number of steroid hormones can also modify the GABA receptor and of these perhaps the most interesting is the stress hormones cortisol. Cortisol may modify the GABA receptor based on concentration. At low levels of stress the cortisol activates the GABA receptor. However, at higher concentration, under conditions of more prolonged or greater stress, the cortisol can block the GABA receptor. Evidence suggests that the effects of cortisol on brain function can include a certain amount of remodeling with may change brain function. Watanabe, M., Maemura, K., Kanbara, K., Tamayama, T. and Hayasaki, H. 2002. GABA and GABA receptors in the central nervous system and other organs. In International review of cytology (Vol. 213, pp. 1-47). Academic Press.